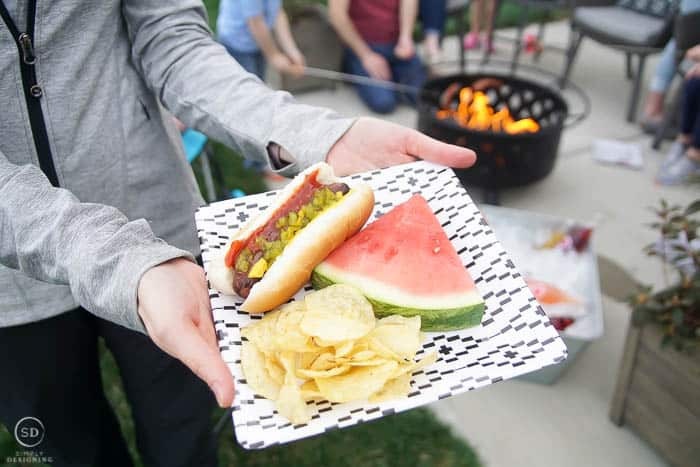 Spring is in full force and in some parts of the world it is beginning to feel like summer, so let’s get ready for summer entertaining with this Family-Friendly Summer Dinner Party Idea! 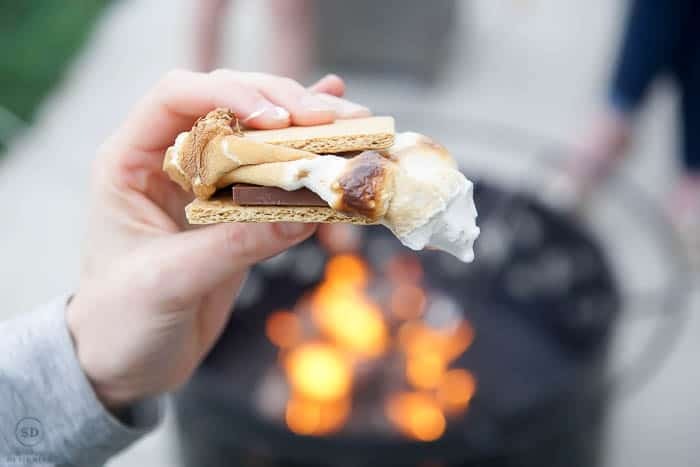 Last year around this time, I shared my idea for Outdoor Entertaining with S’mores (see it here) but this year I decided to up my game and share a summer dinner (with dessert too of course) with family and friends. 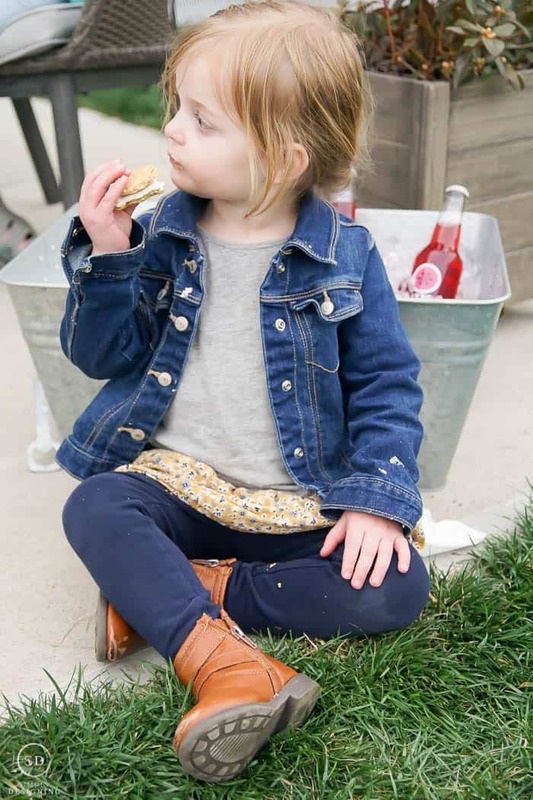 Keep reading to learn how easy it is to host a family-friendly summer dinner party! Last month I shared How to Pot a Plant and a Simply Patio Makeover that I did for a friend, check it out here. 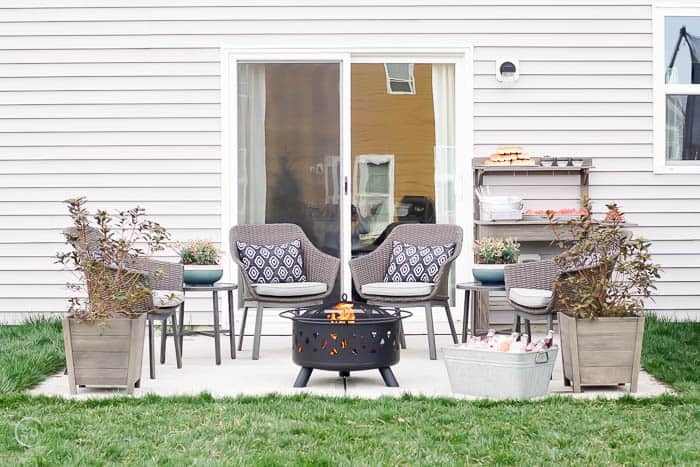 We completely transformed her bare patio into a warm and welcoming space! 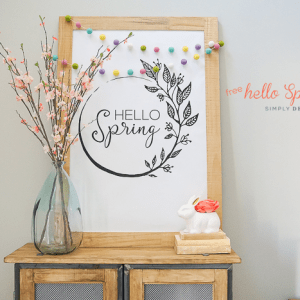 And this month I offered to come over to add one more element to her space (plus gift her some adorable serving ware) and bring in dinner so we could enjoy a fun warm summer’s dinner in their new space with good friends. You know you have good friends when they let you invade their home to grill and have a party, right!? But really, we are moving soon and we are going to miss ALL of our friends so much! So we are soaking up every last minute we can with them. 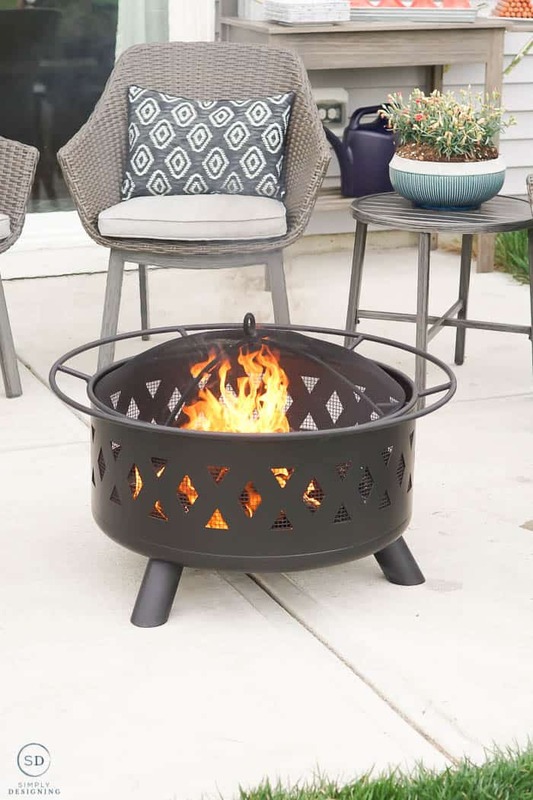 Since we already had a lovely space ready for entertaining, I decided to add one more element to their patio that would make their summer nights so much more fun. 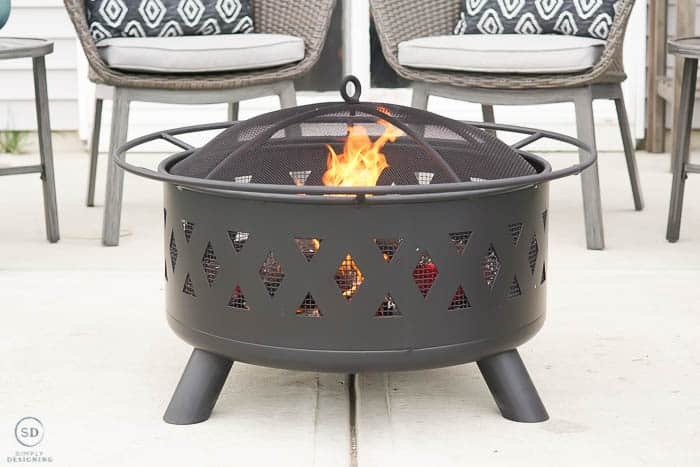 A FIRE PIT! 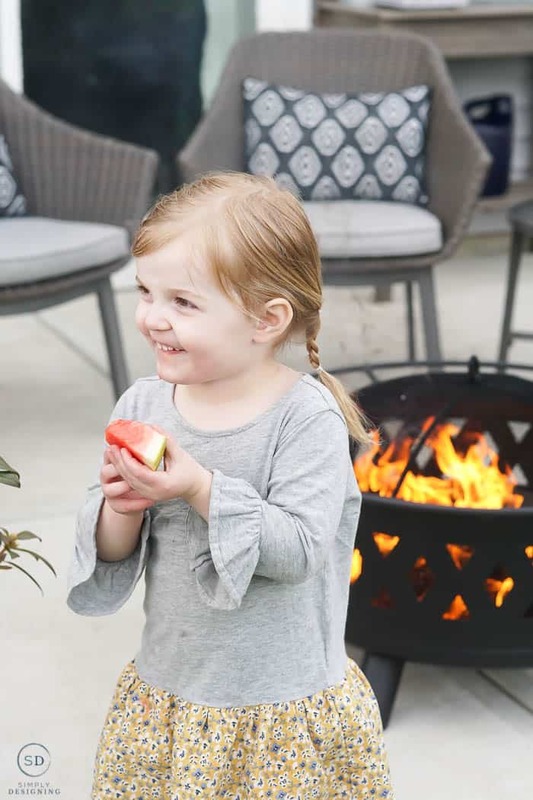 Fire pits are the best for backyard entertaining! We love the one we had at our house, and I knew our friends would love having one too. We decided to re-purpose the Potting Bench we added last month to their space into the perfect place to hold food for a party! I love furniture that can pull double-duty! And we snagged some beautiful, functional i.e. not-breakable (helloooo kids) and perfect for outdoor use. 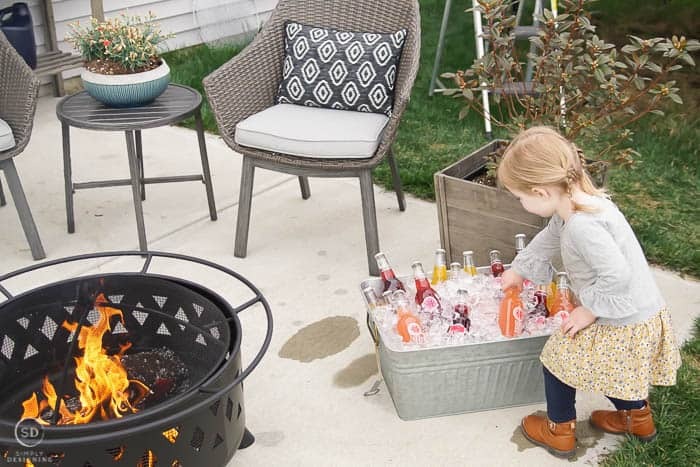 And within minutes, we were ready to party in their newly designed backyard living space! 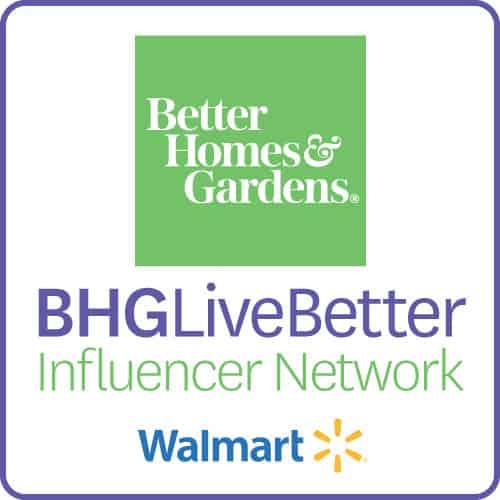 Host outdoors! Take advantage of the beautiful spring/summer/fall weather and host people outside whenever you possibly can. This helps keep the mess in your house WAY down, it is more fun for the kids, and less stress for all the adults! 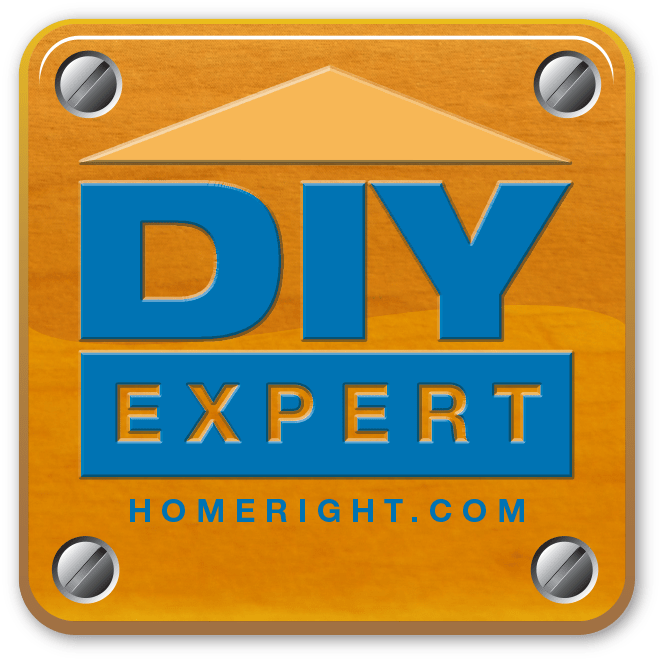 Use throw-away dishes, or easy to clean, non-breakable dishes. Things will fall, so this is not the time to pull out your favorite dishes. I love using either things that can be thrown away or melamine dishes. And serving dishes that are melamine or galvanized steel. For this party, I used a combination of all three. Let everyone cook their own dinner. Seriously! 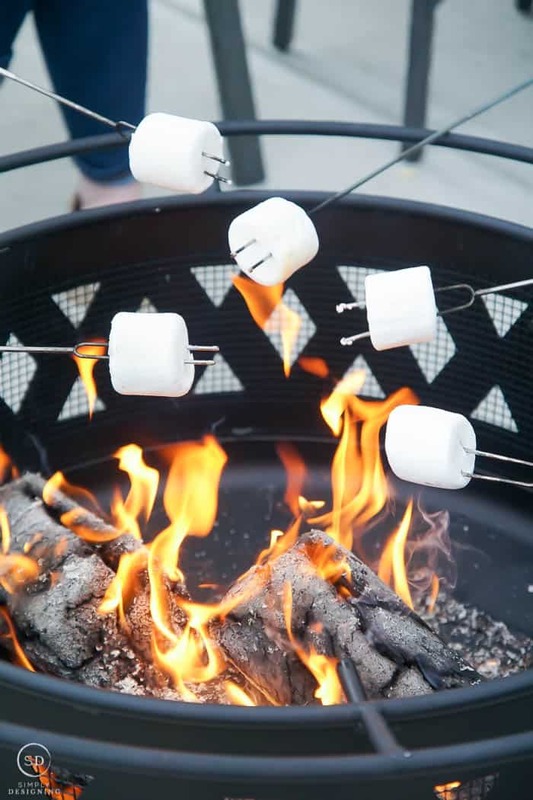 Hosting outdoors means you can light a fire, and let people cook their own hot dogs, bratwursts or tinfoil dinners! Even my two-year-old helped cook her own dinner. This is not only FUN but makes so much less work for the host! Win-win! Keep it simple. 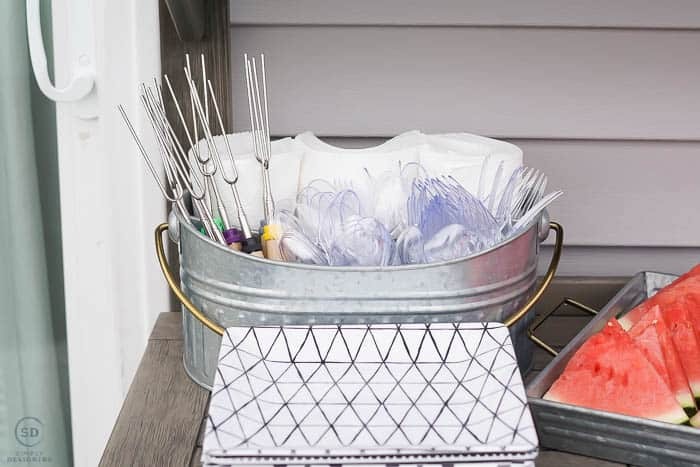 Easy food that guests can make themselves, chips, fruit that doesn’t take a lot of prep and drinks in individual containers will make your life as the planner and host (and clean-up crew) so much easier. This is not the time to feel you need to serve your fanciest food. Keep it simple. 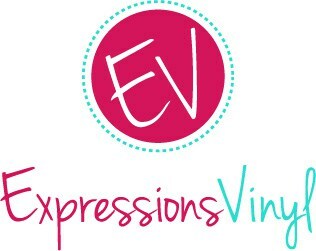 Everyone will love it and it will make your job so much easier. Prep ahead of time so that you don’t need to spend time in the kitchen while you are hosting. Simply enjoy spending time with your friends and family. What food should I bring to a dinner party? If you are going to a dinner party, here are 37 food ideas to bring to a dinner party. 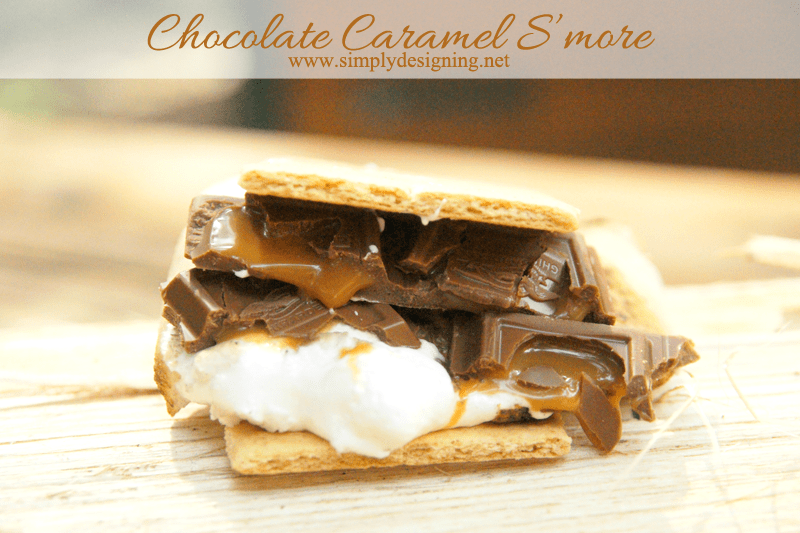 Click on the name to be taken directly to the recipe! 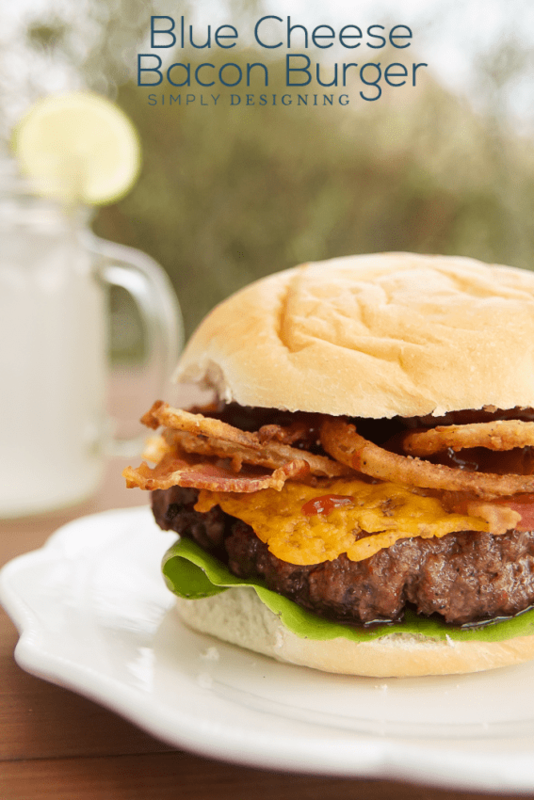 And if you are hosting, this Blue Cheese Bacon Burger is AMAZING! 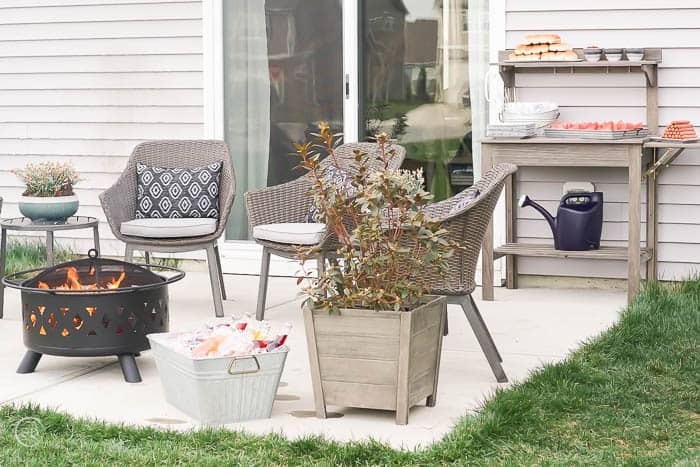 How to prepare your outdoor living space for a summer dinner party. Make sure everyone has a seat. We previously added two of these Better Homes & Gardens Cason Cove Contemporary 3 Piece Chat Sets to their space, but we brought out some blankets and additional camping chairs to add more seating for everyone. Have a designated spot for food, dishes, silverware etc. 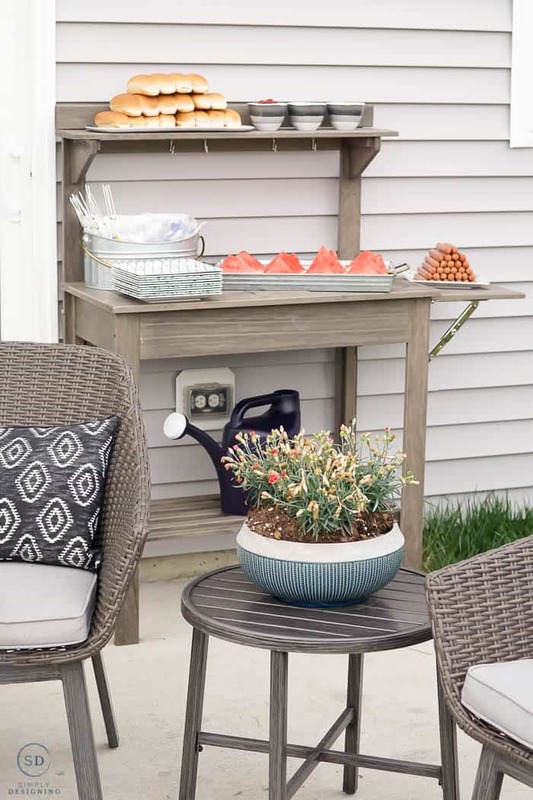 We decided to re-purpose their Better Homes & Gardens Cane Bay Outdoor Potting Bench into the perfect place to put food, silverware and dishes! 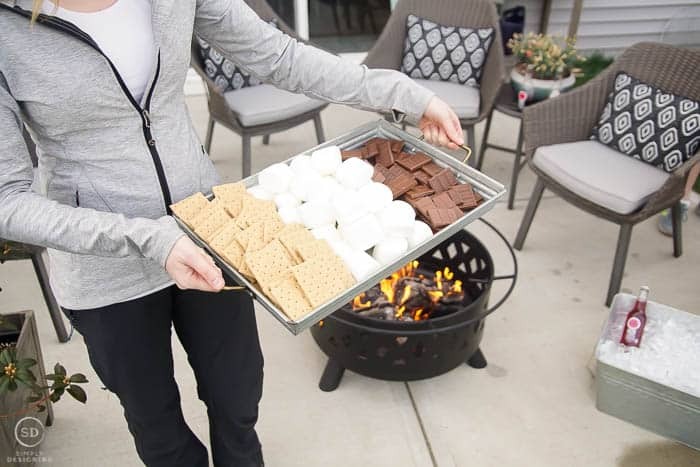 Add a fire pit! 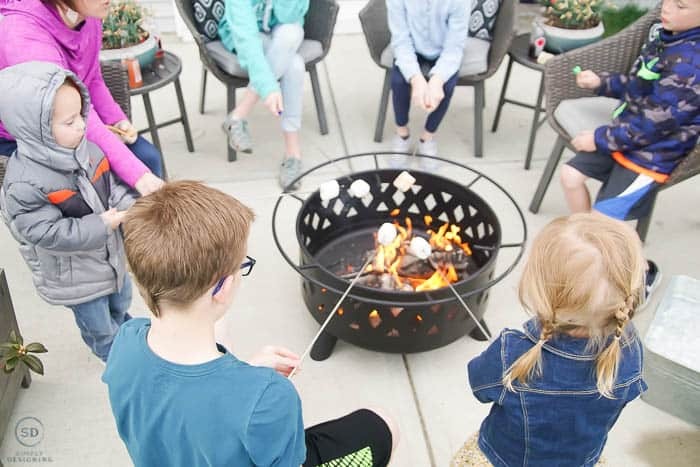 Fire pits are great for creating ambience and for this party we used it to cook hot dogs and s’mores over! 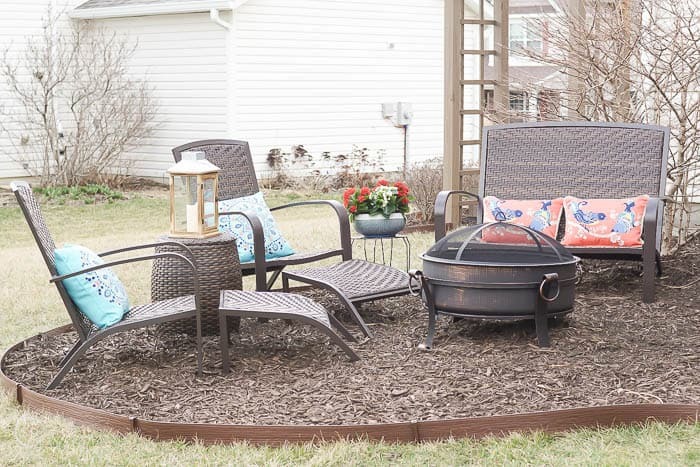 We added a Lattice Heavy Duty Fire Pit. I just love how beautiful, sturdy and trendy it is. I also love that it has a grate on it so that you could easily put food on top of the grate to cook too! 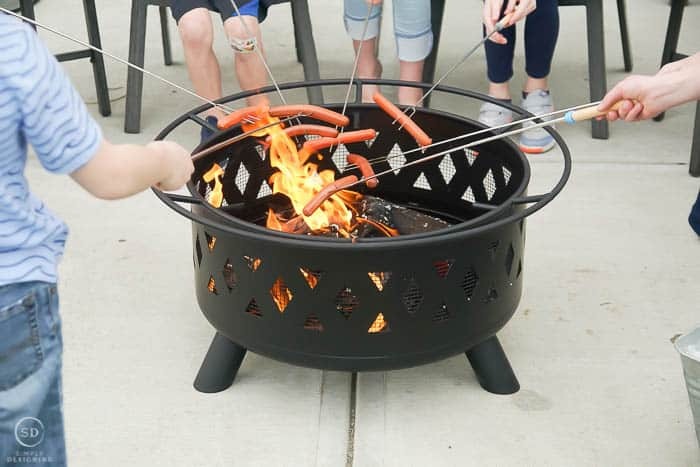 We chose to give everyone a roasting stick to cook their own hot dogs, but if you wanted to, you could have placed them directly on the grate for cooking. 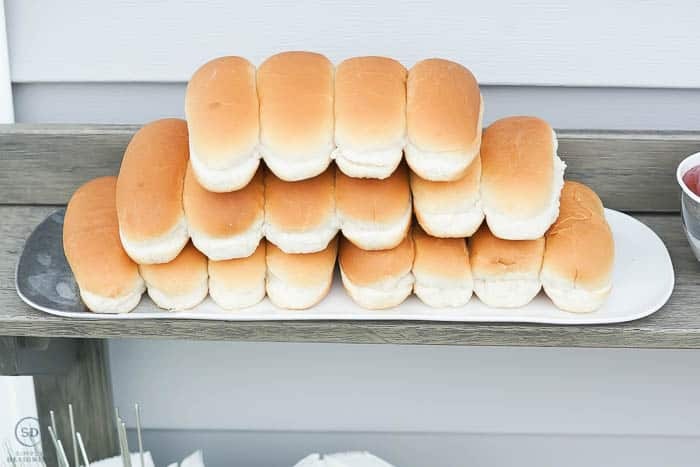 Have enough plates for everyone. We snagged these cute Melamine Salad Plates. 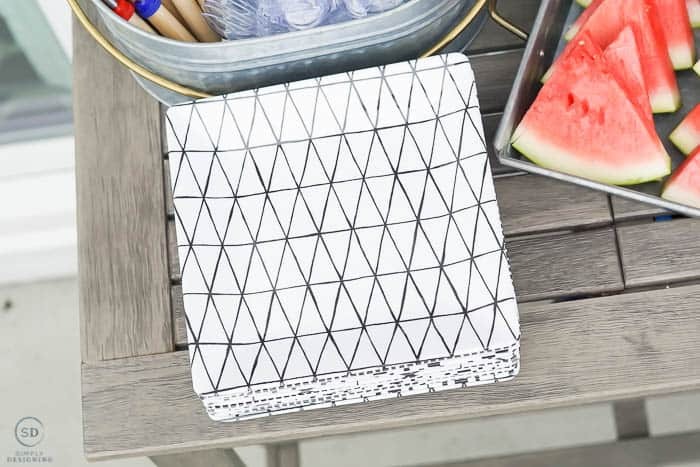 I love melamine plates for outdoor use and use with kids because they don’t break easily, but they are more sturdy than paper plates. And these ones are super cute and match their chairs and their Diamond Wandering Ikat Outdoor Toss Pillows perfectly. Use disposable silverware if you don’t have enough regular silverware or don’t want to get it dirty. 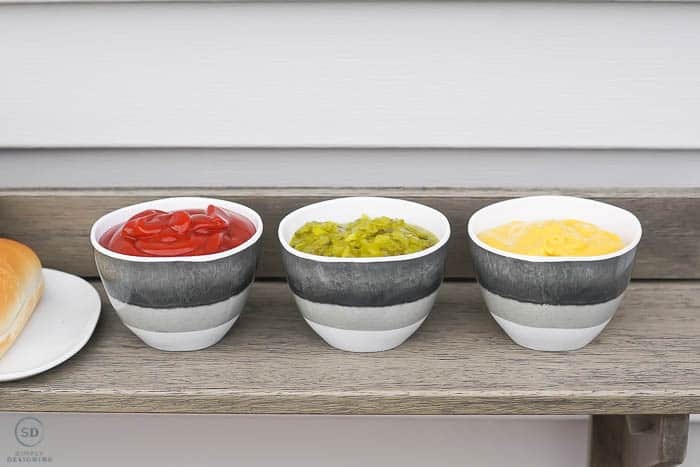 Use serving dishes that are non-breakable and appropriate for outdoor entertaining. 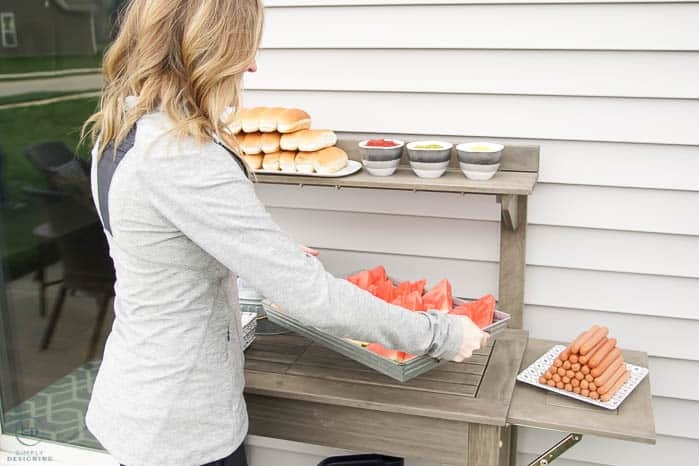 We added these Neutralis Melamine Appetizer Tray with Dip Bowls to hold condiments, hot dog buns, and the hotdogs and a Galvanized Rectangle Tray to hold the watermelon. 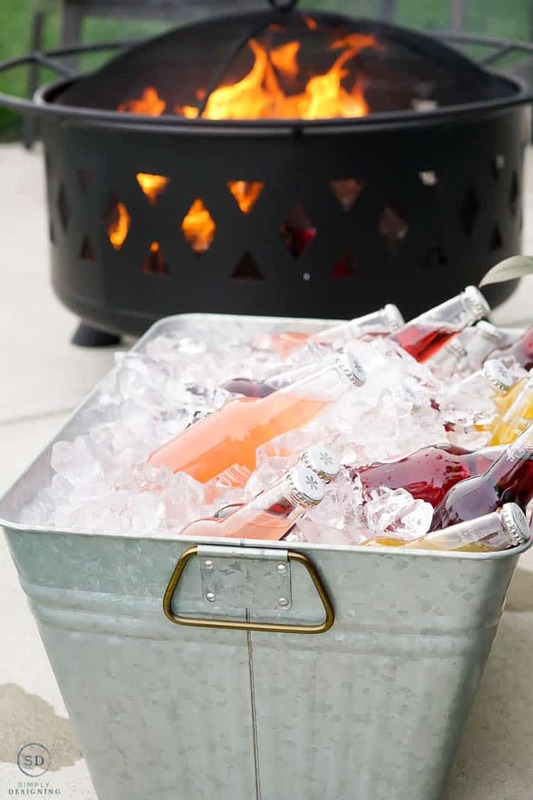 This Galvanized Caddy was perfect for holding our silverware, napkins and roasting sticks and this Galvanized Rectangle Tray was perfect for holding our drinks. Prepare everything ahead of time so that once your guests arrive, focus on THEM and building your relationships with them. What we served at our summer dinner party! 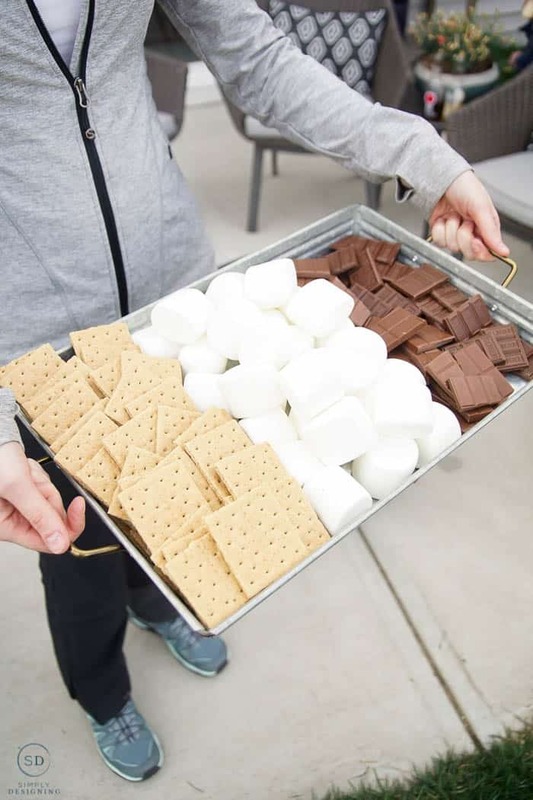 At this outdoor summer dinner party, we decided to make half the fun cooking the meal! 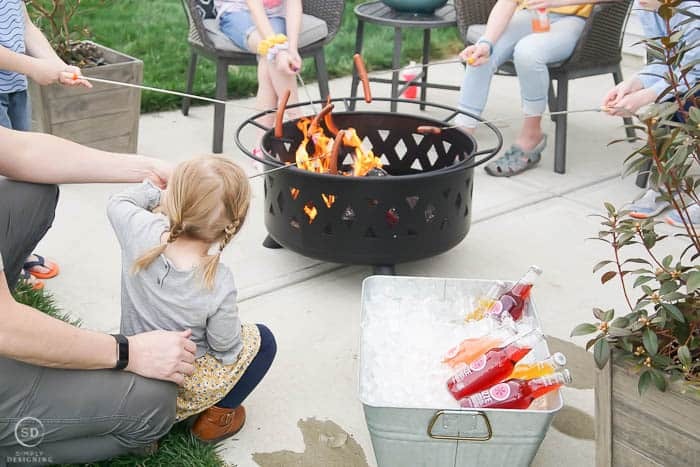 We roasted hot dogs over the fire pit and served them with hot dog buns, ketchup, mustard and relish. 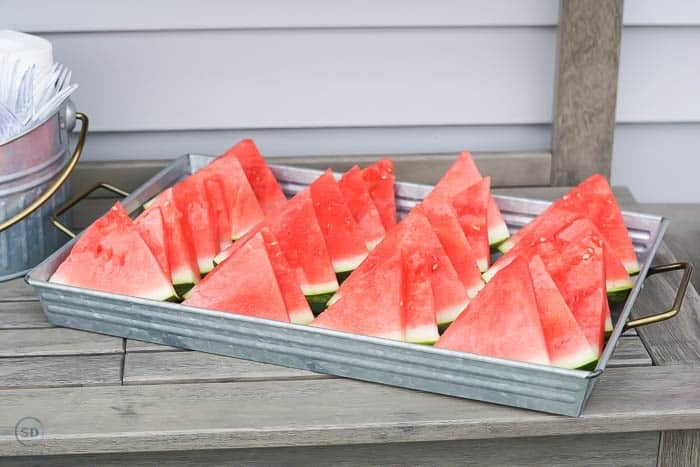 We also served watermelon, chips and drinks. 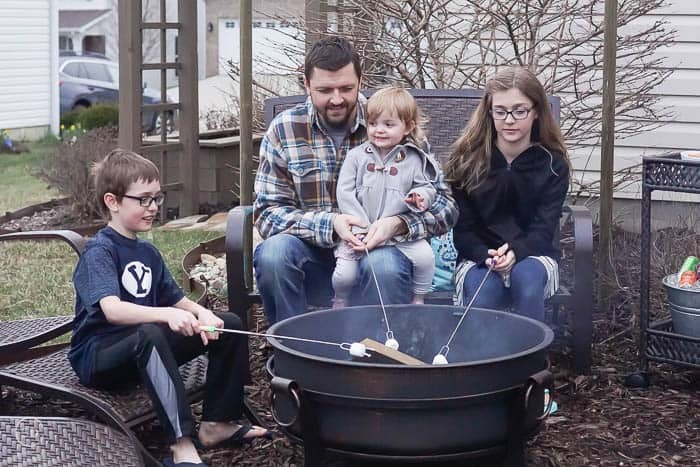 And for dessert, we roasted marshmallows and ate s’mores over a glowing fire. 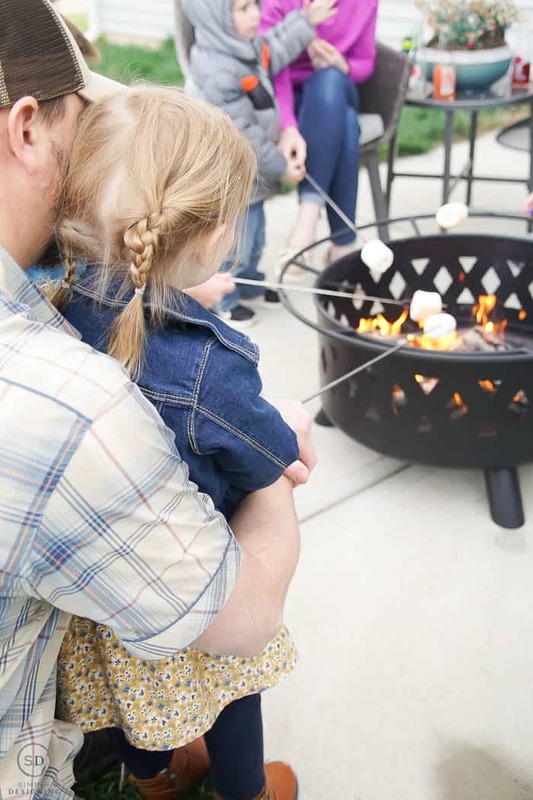 Getting together with friends and family is my favorite thing to do during the spring, summer and fall months and these family-friendly summer dinner party ideas can make any party or get together fantastic! 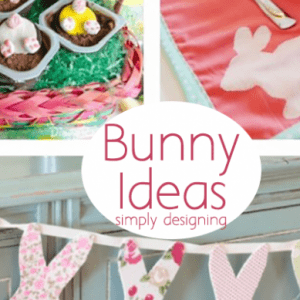 Thank you for these great ideas! I love the potting bench idea. 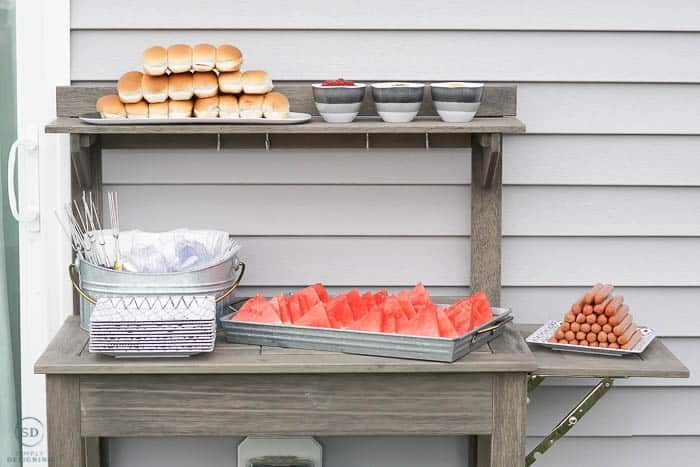 I have been looking at garage sales for a few years now for one that I can repurpose as a drink or food station. I just know I’ll find one one of these days!